3M(TM) Adhesive Transfer Tape 9626 is a 5.2 mil, 3M(TM) Quick Bonding Adhesive 360 tape on a 3.2 mil, Tan 60# Glassine Paper liner. 3M(TM) Quick Bonding Adhesive 360 provides high bond strength and has excellent quick stick properties Up to 350F short-term heat resistance, Excellent solvent resistance, Super quick stick and high adhesion from a thin tape. 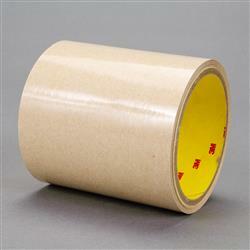 Jaco Aerospace and Industrial is your one stop resource for 3M(TM) Adhesive Transfer Tape 9626 is a 5.2 mil, 3M(TM) Quick Bonding Adhesive 360 tape on a 3.2 mil, Tan 60# Glassine Paper liner. and all of your 3M Products, Tapes, aerospace and industrial needs.